These tests are for low-intermediate students, those studying 3º ESO and 4º ESO, but also for more advanced students. With these tests you can revise some English verb tenses. You may want to read Repaso de tiempos verbales en inglés or other English activities on this blog. I hope you will have fun and learn a lot here . First, read each test instructions to know what verb tenses you have to use. Then, watch the comic strips and read the whole part of the story to understand what it is about. Then, fill in the gaps without listening to the story. After that, press the Verify button and try to correct your wrong answers. Finally, listen to the part of the story to check the pronunciation of words. You may also correct the difficult answers. Click on the image below to look up the difficult words in a good dictionary. 1. 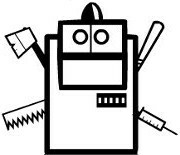 Robots from a distant planet. Present Simple or Continuous? 2. The invasion of the Earth. Past Simple or Continuous? 6. What will happen in the end and in the future? Do you think the human rebels will win the battle against the robots? Or will the robots smash the rebellion? What do they want to do on our planet? What is the future of the Earth? Write your ideas in the text area and press the Submit button. Your replies will be published soon. Writing a comment in this post. Writing a text in this editor and then sending it to your teacher or printing it. Repaso de tiempos verbales en inglés, which is a formal approach. 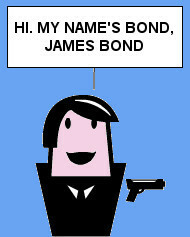 James Bond - Mission Accomplished, an activity with tests and stories. I have created the tests with Hot Potatoes, which is a very well-known application in the education field. I find it curious that the Linux version of Hot Potatoes, the one I use, creates all the gaps (or text fields) in the tests with the same length, while the Windows version resizes each gap to the word length, thus giving an important clue to the student. I have drawn the comic strips at Stripgenerator.com, a very good and funny web service, where you can publish your drawings in a gallery. The audios in the tests have been created with the Interactive TTS Demo on Loquendo web page, a text to speech application. Although the quality of speech isn't perfect, it's a very practical solution for short passages of texts. Then, I have used Sound Cloud to upload the audios and get the codes to insert them here. The texts areas applications in section 6 are two resources created in this blog using PHP and the TinyMCE HTML editor. The spelling can be corrected using Revisor o Stilus, two interactive tools for correcting texts.